See you soon in Lille (France). Happy happy birthday, Don! Good luck, happiness and health! Happy Birthday Don! May the old Duck in the Sky still bless you for years to come! 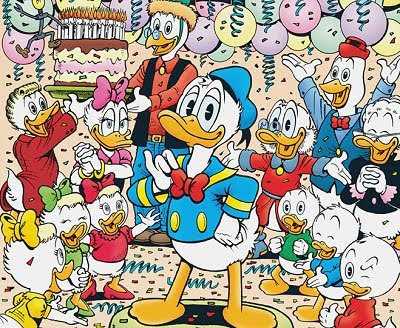 Happy Birthday Don Rosa! I love the life and times of scrooge mcduck and all stories of you! I wanted to congratulate them afterwards to the round 60th Good health, happiness, fun and comics. Sorry for the delay and my bad english. I read with her ​​enthusiasm and her role model Comics Carl Barks. Scrooge is also my favorite character. I hope you've spent a very good day full of happiness and gifts! See you in November at the Lilles Comics Festival! GOOD AND HAPPY BIRTHDAY !!! Sorry for the two days of delay. I hope you enjoyed it with your family and friends ! Your stories are the best stories. Your work has changed my perception of Disney comics forever. Since I discovered your stories in french "Picsou Magazine" when I was twelve, I understand Disney comics can be sensible, cultured stories, and not mere chil amusement. Us Scrooge fans, we DO miss you. I'm looking forward to seeing you in Lille.